Can I Put an Above Ground Pool on Artificial Grass? Home > Knowledge Center > Can I Put an Above Ground Pool on Artificial Grass? In-ground pools are expensive and permanent, which does not always work for homeowners with limited budgets or a desire to have flexible outdoor spaces that can be used for multiple purposes. 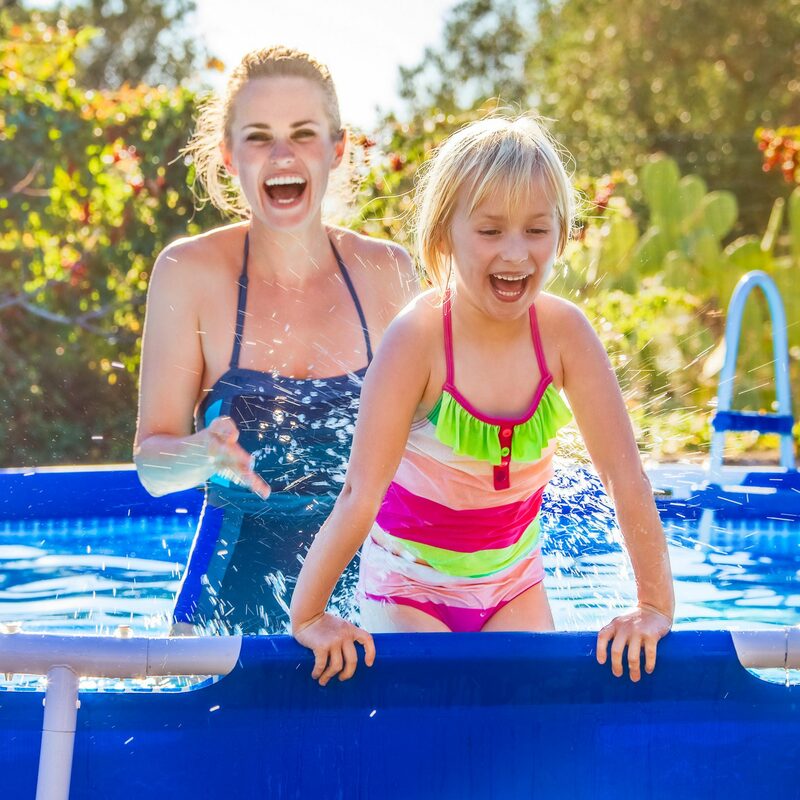 One solution for these dilemmas is to opt for a less-expensive, less-permanent, above-ground pool that their kids and guests can enjoy during summer and that can be taken down in winter or when the children get older. If you are thinking about installing an above-ground pool, one important consideration is the type of surface on which you will place it. Since this type of pool is generally considered a temporary feature and installed in an already landscaped backyard, they are commonly placed on lawn areas. Since this is quite common, let’s take a look at a few things you should consider when placing a pool on either a natural grass lawn or artificial turf. Installing an above-ground pool on a natural grass lawn is not a good idea, particularly if you plan on taking down the pool for part of the year. There are several reasons why natural grass and above-ground pools do not mix well, but one of the most important is that the pool is going to kill the grass. There is no way around it. If you leave your pool up for any length of time, the grass under the pool will die. If you take the pool down over winter, it is possible that the grass will come back over time, particularly with re-seeding. However, there is a good chance that around the time your natural grass finally starts to look good again, the weather will be warming up, and it will be time to bring the pool out again, which will start the cycle all over. It is also a challenge to keep natural grass around a pool looking lush and healthy, whether it is an in-ground pool or above-ground pool. This is due to heavy traffic, excessive water creating mud and pool chemicals damaging the grass. Since natural grass does get muddy and can be quite slippery when wet, there are also issues around safety and, of course, tracking mud and wet grass into the house. With all of this being said, it should be noted that above ground pools are very commonly placed on natural grass lawns, since this is still the groundcover most often found in backyards across the country. Usually, these homeowners simply accept that they will have a circle of dead grass and a noticeable depression where their pool sits during summer. There are many reasons that artificial grass performs better than natural grass around swimming pools. The first thing to note is that synthetic turf can withstand pool chemicals that will quickly kill or discolor a natural grass lawn. Secondly, properly installed turf provides drainage that is as good as or better than the drainage offered by a typical, natural grass lawn. Additionally, there is no mud to cause slipping or be tracked into the house and no wet blades of grass for you to mop up every time the children run through the back door. Artificial grass is also less slippery than a conventional lawn and has no problem holding up to the heavy traffic that often occurs around swimming pools. If you place any pool that is filled with water on top of fake grass for any length of time, the blades are going to flatten. However, all you need to do is brush them back up when you remove the pool, and your lawn will be back to looking lush and inviting. 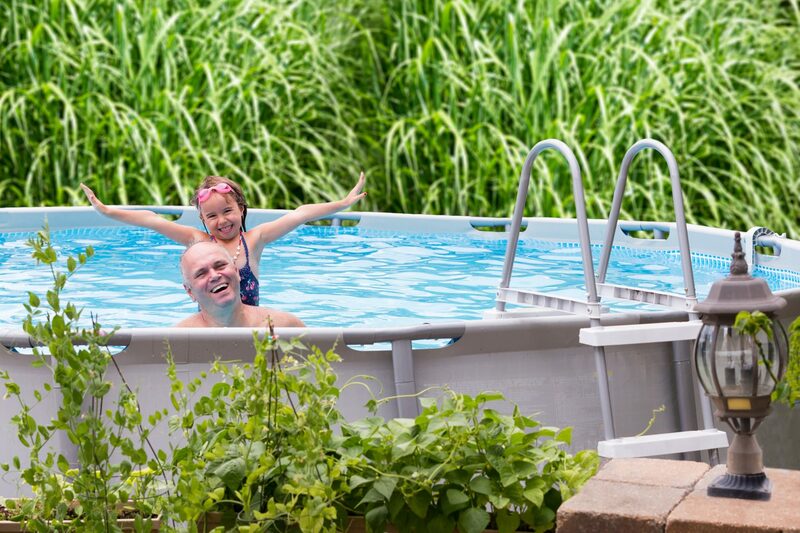 One of the issues you will face when installing an above-ground pool on any surface is determining whether or not the surface will provide a solid foundation that can withstand the immense weight once the pool is filled with water. After all, even the water in smaller, above-ground swimming pools weighs tens of thousands of pounds. Therefore, if you plan on placing an above-ground pool on your lawn, it is imperative that you consult your artificial turf installer to discuss potential issues with the weight and to consider options when laying the base to achieve the best possible outcome. It is also important to note that placing tens of thousands of pounds on almost any surface for an extended period of time has the potential of causing a depression in the ground. Regardless of where you place your pool, it is incredibly important that the surface is level. A gentle slope causing a discrepancy of just a couple of inches can shorten the life of your pool and cause the lower wall to sag or fail. Therefore, if you plan to place your pool on your artificial grass lawn, it is important that you relay this to your turf installer. It is often the case that homeowners want their natural or artificial lawn to follow the natural slope of the ground; however, this type of installation is not ideal for above-ground pools, which require a level surface. Natural Grass vs. Artificial Grass Around Swimming Pools?